Since launching our first tracker in 2007, Fitbit has transformed millions of lives by redefining what’s possible. It’s a history built by inventing the future. Our technology has never just been about building trackers. It’s about you—and finding better ways to help you live a healthier, more active life. So when we say we’re dedicated to creating smarter sensors, fashionable form factors, efficient electronics, intuitive interactions and engaging social features, it’s because we’re dedicated to you. Know your heart with PurePulse®. Tracking your heart is incredibly valuable. And with PurePulse—the first automatic, continuous, chest strap-free heart rate technology—it’s easier than ever. Magically measure exercise with SmartTrack™. We’ve taken the work out of workout tracking with SmartTrack—a technology that automatically recognizes your exercises and records them for you in the Fitbit app. Shed light on your night with sleep tracking. By automatically measuring your time asleep, restless and awake, Fitbit trackers help you understand each night to make the most of each day. The evolution of our heart rate revolution. In 2007, the benefits of tracking heart rate were becoming more and more well known, but getting those insights was a bit more challenging. The technologies were expensive, uncomfortable and definitely not wearable from day to night. In clinical settings, researchers were using electrocardiograms (EKGs), which cost around $5000. Athletes and weight loss hopefuls were using chest straps, but those could irritate the skin when worn for long periods of time. We wanted to make heart rate accessible to everyone—which meant it needed to be wearable and affordable. Through trial, error and a lot of innovation, we created PurePulse: automatic, continuous heart rate tracking. The technology inside PurePulse was inspired by hospitals—which clipped a thimble-sized sensor onto the finger and used a technique, called photoplethysmography, to measure heart rate. For that technique to track heart rate on the wrist, during workouts and in various environments required an extraordinary amount of research and refining. Photoplethysmography is a long word with a short explanation: light can be used to measure blood flow. When your heart beats, blood flows, and the volume of the blood in your wrist changes. Blood—interestingly enough—absorbs green light. The higher your blood volume is, the more green light is absorbed. To calculate blood flow, PurePulse shines a green light onto the skin and uses light detectors called photodiodes to measure how much light is being absorbed. This measurement is used to determine how many times your heart beats per minute. Heart rate drives some of your favorite Fitbit features. With PurePulse, tracking your heart rate trends is just the beginning. Measure heart rate when you’re most rested to assess your heart health. Use real-time heart rate zones to understand your effort during workouts. See how fit you are and gauge oxygen consumption without a strenuous V02 Max test. Relax anywhere with personalized breathing sessions based on your heart rate. With validation from a number of external studies, PurePulse technology has surpassed industry expectations and is fueling research across the globe. Tracking your exercise is officially effortless. SmartTrack currently recognizes seven distinct activities, but we are continuously researching more exercises to add to that list. How SmartTrack got its start. In 2009, we started looking for new ways to track activity beyond just steps. Because everyone has a different path to fitness and seeing how much you’ve done keeps you motivated to move more. So we started developing SmartTrack—a tracker technology that would automatically recognize your exercise for you and record it in the Fitbit app. We knew academics were automatically recognizing activities by putting up to 20 sensors all over the body. Our challenge was to do the same with only one sensor—on the wrist. By automatically logging your activities in the Fitbit app, SmartTrack helps you see how everything you do gets you closer to your exercise goals. A simple accelerometer. Seriously smart algorithms. SmartTrack uses a 3-axis accelerometer to detect the intensity and patterns of your movement and determine which kind of activity you’re doing. From there, a series of algorithms are applied to that data, whittling down thousands of possible activities to one, singular exercise. It’s a technology intelligent enough to not only detect what you’re doing, but to also ensure you get credit for the right activity. So, doing laundry isn’t recorded as dancing or playing guitar isn’t recorded as playing sports. Unless, of course, you’re actually doing both at the same time—in which case, nice work. Researchers spent thousands of hours testing thousands of activities—from high-intensity exercises to everyday, mundane movements. Once our rigorous validation was complete, SmartTrack was ready to be released to users. Working to fit a sleep lab in a sensor. Sleep can have a huge impact on your overall health. But in 2007, the only way to measure it was with bulky, portable equipment or through overnight clinical assessments. Sleep tracking was time-intensive, highly expensive or just plain uncomfortable. To truly empower people to change their habits and their health, we knew it had to be more convenient and insights had to be easy to understand. So we packed unparalleled sleep technology into a tiny, affordable tracker and paired it with a user-friendly app experience. Then, we made sure the technology wouldn’t drain your battery — Because you can’t track your night if you have to charge your tracker. Fitbit automatically tracks your sleep. The rest is up to you. 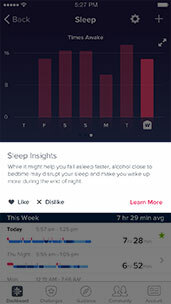 With innovative tools from Fitbit, all you have to do is wear your tracker to bed to learn how long and how well you slept & get guidance to help you sleep better. Deeper insights, at your fingertips. Using the power of PurePulse® heart rate, sensitive motion detectors and powerful algorithms, Fitbit’s R&D team unlocked the key to understanding your sleep quality: sleep stages. 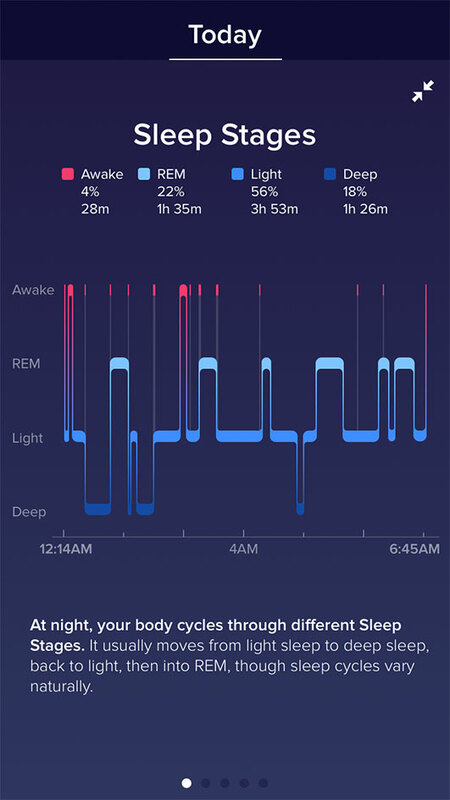 Now, your Fitbit tracker can record your time spent in light, deep & REM sleep, as well as your time awake, then distills that information in easy-to-reach graphs in the Fitbit app. Tracking sleep has eye-opening results.